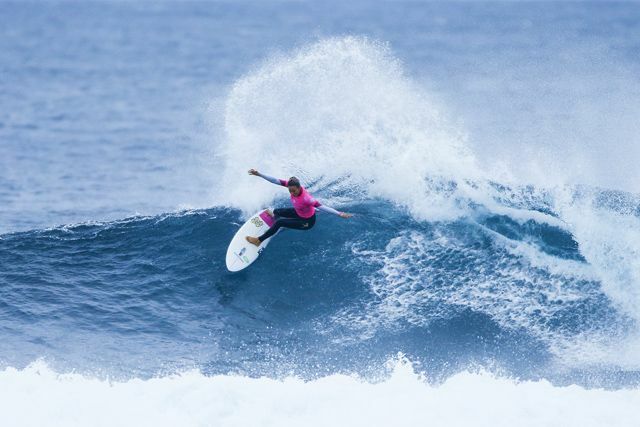 Surf News Network, 11 April, 2016 – The Drug Aware Margaret River Pro blazed through Women’s Rounds 3 and 4 to narrow the field down to the remaining eight Quarterfinalists. The third stop on the 2016 Samsung Galaxy WSL Championship Tour, the Drug Aware Margaret River Pro, saw clean 4 to 6 foot waves (1.5 metre) at Main Break in Western Australia and the usual suspects in terms of WSL Title contenders separated themselves from the rest of the field. Courtney Conlogue (USA), current WSL Jeep Ratings Leader, continued her dominance at Margaret River against Malia Manuel (HAW) and Nikki Van Dijk (AUS) in the non-elimination Round 3 match-up. Conlogue dropped two solid rides to lock in a 15.33 two-wave combined score. Manuel challenged Conlogue with a 7.33, but could not find the 8.04 required to defeat Conlogue. Van Dijk attempted some high risk maneuvers, but was not able to land the rides to complete the scores. Round 3 Heat 4 witnessed an all-Australian match-up between the current World No. 2Tyler Wright (AUS), Stephanie Gilmore (AUS), six-time World Champion, and local favorite Bronte Macaulay (AUS). Wright squeaked through the Quarterfinals with a buzzer-beater win against Gilmore. Needing a 5.23, Wright answered with a 5.30 to send Gilmore to Round 4. Stephanie Gilmore (AUS) was sent to battle in elimination Round 4 against Sage Erickson (USA). Gilmore knocked out Erickson with two solid 8-point rides, giving her a 2.36 lead over Erickson’s 14.74 two-wave combined score. Erickson will leave Margaret River with a 9th place finish. Gilmore will advance to the Quarterfinals. Carissa Moore (HAW) barely came through Round 3 Heat 3 against Bianca Buitendag (ZAF) and Sage Erickson (USA). Erickson got off to a quick start by securing the first two rides of the heat, but Buitendag and Moore swept passed Erickson in the dying minutes. Buitendag threw up a massive 9.40 ride to take the second position, while Moore secured two 8-point rides to advance to the Quarters. Sally Fitzgibbons (AUS) blazed through the opening heat of Round 3 against Tatiana Weston-Webb (HAW) and Laura Enever (AUS). Fitzgibbons earned a solid 15.50 two-wave combined score, leaving a healthy gap between Weston-Webb and Enever. Fitzgibbons will move on to the Quarterfinals. Laura Enever (AUS) eliminated Malia Manuel (HAW) in Round 4 to stay alive in the competition. Enever, who has had a slow start to the 2016 season, solidified her first Quarterfinal entry since the 2015 Fiji Pro. Enever secured the win with a buzzer-beater wave to knock out Manuel by only 0.30 points.